At the Thornton Wilder Conference, Professor Benfey will take part in the "Wither Wilder" panel, along with Carl Forsman and David Greenspan, chaired by Tappan Wilder. Together they will discuss the questions that bedevil Wilder on page and stage: Where does Wilder fit in? Does it matter? This session will take place on Friday, July 13 at 11:15 a.m. at the Monadnock Center in Peterborough, NH. Reservations available here. 1. What is your favorite Wilder quote? "We do what we can. We push on, Esteban, as best we can. It isn't for long, you know." --Captain Alvarado in THE BRIDGE OF SAN LUIS REY. 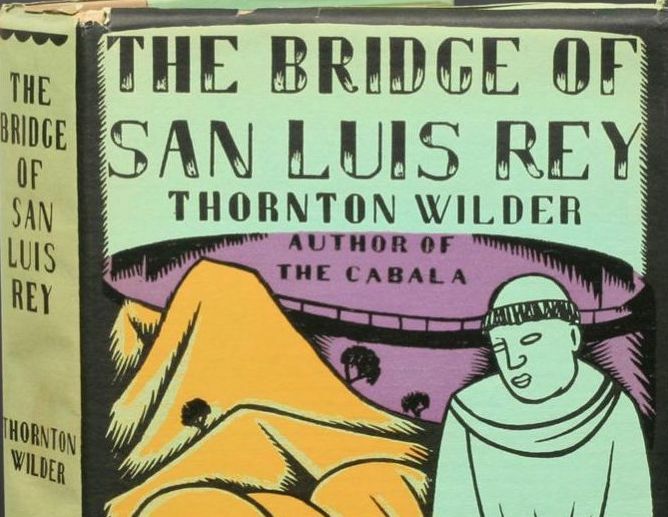 THE BRIDGE OF SAN LUIS REY. What better argument could there be for the deep truth that life does not consist of the pursuit of happiness but rather of the pursuit of love? I'm a big fan of Captain Alvarado, who, like some of Wilder's most interesting characters, haunts the fringes of the narrative. He's a great traveler, like Wilder himself, and makes it his business, like Wilder, to connect his life with the lives of others. He's the character I would MOST want to be like. My favorite Wilder hero is Emily Webb, of course. I think she's partly based on Emily Dickinson, whose poetry Wilder loved. "It goes so fast," Emily says at the end of OUR TOWN. "We don't have time to look at one another." I was much taken with Alix, the Princess d'Espoli, when I first read THE CABALA, Alix who is "a pure well of heartbroken frivolity." I can't remember which Greek goddess she corresponds to. Aphrodite, maybe? But I'd like very much to meet her again. George and Emily in OUR TOWN, after he asks to carry her books home. What could be better?